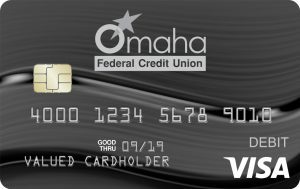 To report a lost or stolen VISA® Check card during normal business hours, please call Omaha FCU at either 402-399-9001 or 1-800-660-7350. After hours, please report your lost/stolen card by calling 1-800-472-3272. You can also use our two electronic forms to report lost/stolen cards or replace damaged VISA® Check Cards. An Omaha FCU VISA® Check Card works like a check. In fact, you can think of it as a plastic check. It can be used at any merchant that accepts VISA® for payment of products or services or at the ATM. With a Check Card you can forget the hassles of showing an I.D., waiting to have a check approved, or having to carry lots of cash. Plus, you’ll save money by writing fewer checks. And it really pays to use your Omaha FCU VISA®. Omaha FCU offers a special program called UChoose Rewards to our VISA® Check Card members. The UChoose program allows us to reward you for using the Omaha FCU Check Card for purchases. Every time you use your Check Card, and sign for your purchase, you will earn bonus points that can be exchanged for gift certificates and merchandise. Remember, you must sign your purchase receipt rather than inputting your Personal Identification Number (PIN) for the purchase to be eligible to earn bonus points. If you use your PIN when paying for your purchase (such as at the check-out PIN pad) that purchase will not be eligible to earn bonus points. In most instances, this could be as simple as selecting “Credit” instead of “Debit” at the check- out terminal. So the more you sign – the more bonus points you will earn. Want to know where the nearest VISA® or Plus ATM is located in a particular state or country? Then check out the VISA®/PLUS ATM Locator . UChoose Rewards – our newly enhanced rewards program that gives you accelerated earning opportunities and virtually unlimited ways to redeem all the points you earn using your Omaha FCU VISA® Check Card. These points can then be redeemed for just about anything – it’s your choice! Choose from millions of options – whether it’s gift cards, products, travel experiences, activities, event tickets- a vast online rewards catalog filled with practically unlimited options awaits you. To get started, visit www.uchooserewards.com be sure to visit often to check out your current point balance, featured retailers for extra earning opportunities, and an amazing assortment of redemption possibilities. Click here for information about Omaha FCU’s Checking Account.